Mount Royal students can submit outstanding research to the Library Awards for Research Excellence by April 10, 2019 for a chance to win a cash award from one of three categories. 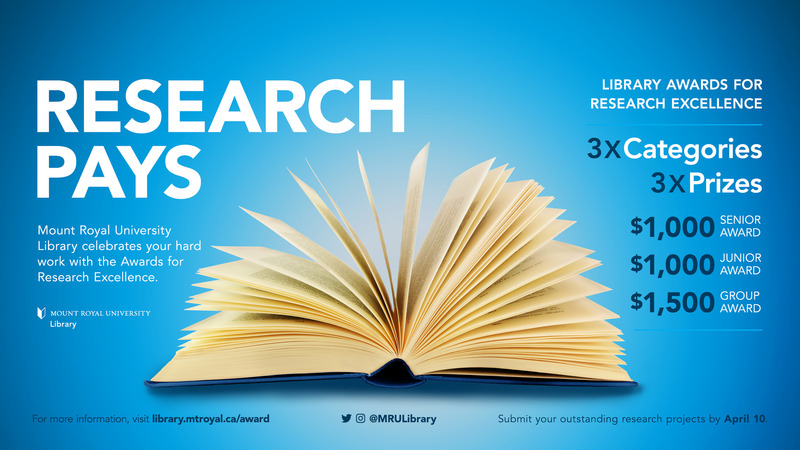 The Mount Royal Library Awards for Research Excellence celebrates students who produce outstanding scholarly projects such as essays/papers, film projects, poster presentations, web or technology-based projects, or creative works that demonstrate research skills and the effective use of information resources. Senior Award – $1000: For projects created in 4000-level or higher courses, independent studies, capstone or honours thesis work, this category recognizes projects which are larger in scope, represent a higher level of independence and a greater depth of research. Junior Award – $1000: For projects created in 1000-level to 3000-level courses, this category recognizes outstanding student work at a level that is smaller in scope and depth of research. Group Award – $1500: For projects created at any course level, this category recognizes outstanding student work completed by 2 or more students.The award will divided equally among group members. Visit library.mtroyal.ca/award for complete details including submission requirements.